Being by preparing your chocolate cake. (You can definitely use a homemade chocolate cake if you prefer!) Add 1 teaspoon of black food color to the batter and mix to combine. Equally divide cake batter between three 6-inch round cake pans. Bake according to directions. Allow cakes to cool to room temperature and then level them so that they are all the same height. In the bowl of an electric stand mixer fitted with whisk attachment, whisk butter and sugar on medium high speed until very pale and fluffy or about five minutes. With the mixer off, add in dark cocoa powder, vanilla and salt. Add in 1 teaspoon of black food color. Now prepare your “slime”. This has got to be the most fun part!! When I first had the idea to create this cake I could not image how to make an edible slime. My kids actually thought of using pudding! It’s the perfect texture and consistency! When I first had the idea to create this cake I could not image how to make an edible slime. My kids actually thought of using pudding! It’s the perfect texture and consistency! Follow the instructions on the pudding box, adding the lime extract and food color to the mixture as you blend ingredients. Cover the mixture and place it in the refrigerator for at least an hour, or until you are ready to use it. Place some of your buttercream into a pastry bag. Set one layer of cake on cake stand or serving platter, then place that on top of your rotating cake stand. 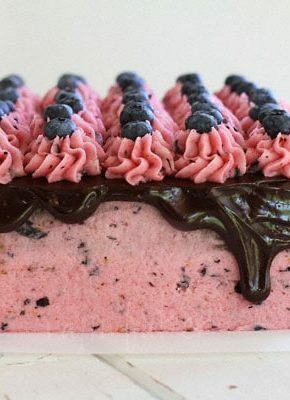 Pipe buttercream around the edge of the cake. This is essentially creating a “wall” or a “dam” to hold in the slime pudding. Add about 1/2 cup of slime pudding to the center and smooth out. 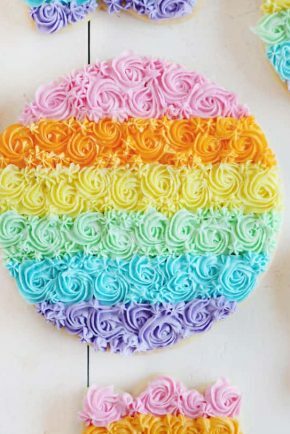 Place another layer of cake on top and then pipe out another ring of buttercream around the edge of the cake. Fill will approximately 1/2 cup of slime pudding. 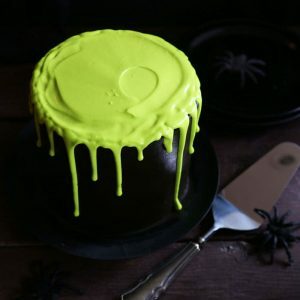 Pour any remaining slime pudding over the top of the cake then chill until ready to serve. Best served within 24 hours of assembly and served chilled. 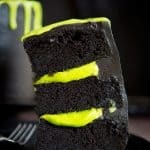 PRO TIP: For an extra awesome “drip” down the sides of the cake, add your slime pudding to a pastry bag and cut off a small portion of the tip. Then just drizzle the pudding down the side in a controlled drip. Easy peasy! Isn’t that fun! 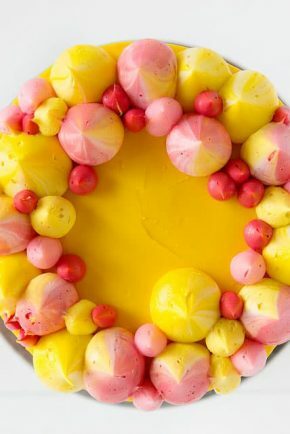 This Slime Cake is definitely going to impress everyone who sees it! 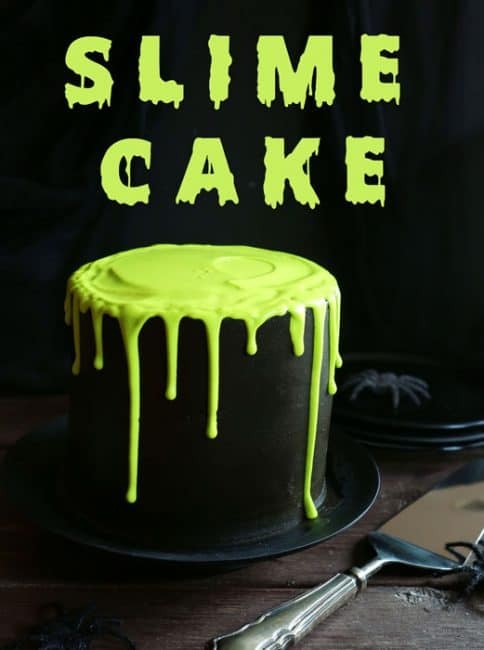 Check out this video of my super Easy & Fun Slime Cake! I only work with brands that I love! A big thank you to McCormick for partnering with me and allowing me to create cakes and delicious treats with there wonderful products. And thank YOU for supporting the brands that support iambaker! You literally are the queen of cakes. 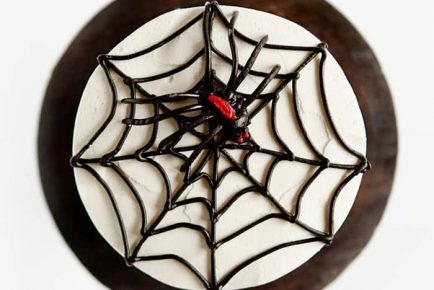 I happen to LOVE all things Halloween, and was looking for a Halloween dessert for a party I’m throwing…SO, this! Whoa this looks so cool! That green is awesome! Fun! 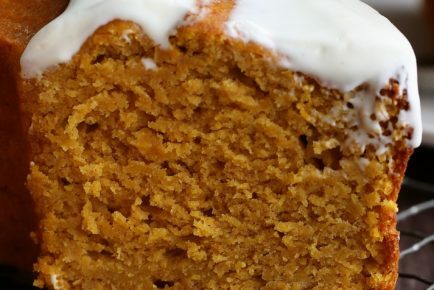 What a great Halloween recipe! Oh lime extract? I love that. I had no idea it was a thing! Glad to find out it is! What a fun cake for Halloween! My boys would love this cake! SO FUN Amanda. You are my frosting favorite! Does the lime extract make it taste like lime? can i use something other than the lime extract? 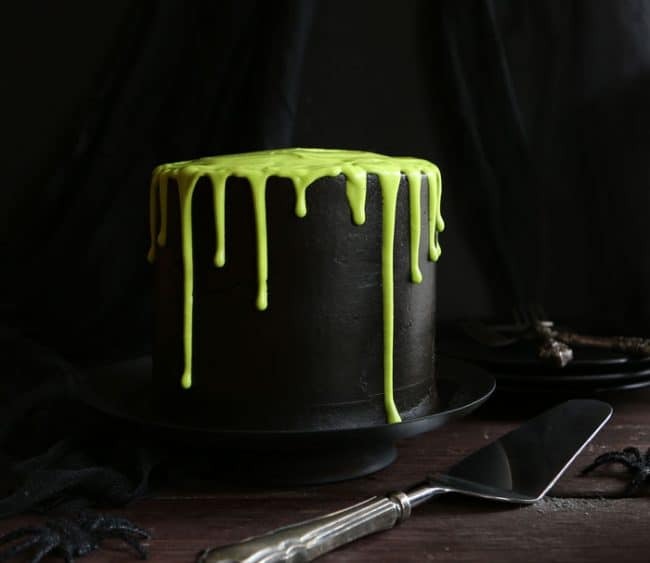 What a seriously fun Halloween cake! The slime oozing everywhere is perfect! Love that your kids came up with the idea to use pudding! 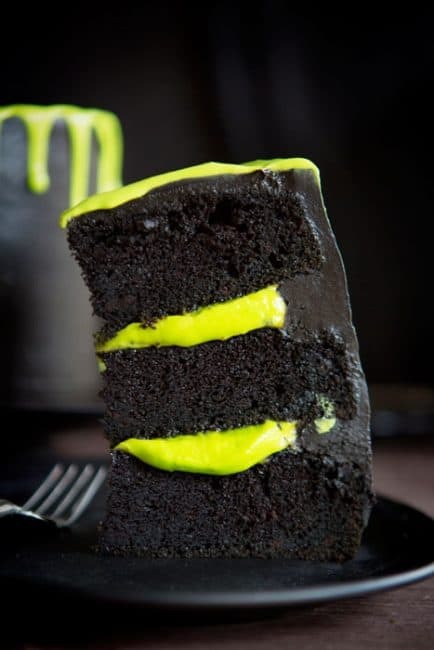 This cake looks like a great idea for Halloween, I can also add some decoration on top! I don’t have access to Lime extract is there a substitution I can use? I love all the colors! I use it just last night making chocolate candy flower suckers, it changed the texture of the white chocolate a little but I was able to use it on the flower petals and the different shapes in the flowers and it worked out great. I would recommend this product. I was wondering if the pudding went *funny* if not being eaten until 48 hours later? Can you use 9inch cake pans instead? 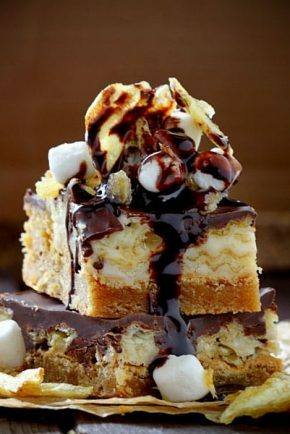 Would just need to double up recipe? If I were making a new recipe for a client I would be sure to test it first. In a situation like that, I would have instructed the client to pour the slime over either right before or AT the party… folks get a kick out of that kind of thing. What brand pudding did you use? I used jello instant vanill vanilla and it’s too translucent you can see the dark cake through it.